8 SMT Magazine • June 2017 Q: Are you using 3D as part of your inspection strategy? Source: I-Connect007 Survey No 60% Yes 40% by Stephen Las Marias I-CONNECT007 The Need for 3D AOI The continuing trend towards miniaturiza- tion of components, more advanced compo- nent packaging with finer lead pitches, and in- creasing component densities in smaller PCB sizes are driving the need for an even more ac- curate inspection systems to detect defects in PCB assemblies. According to a new report by industry ana- lyst MarketsandMarkets, the global AOI market is expected to reach $1 billion by 2022, register- ing a CAGR of 17.1% between 2016 and 2022. The report added that 2D AOI systems, which have been widely accepted and have been in use for many years, will continue to hold a larg- er share of the overall AOI systems market due to their advantages such as cost-effectiveness, high-speed inspection, and the ease of pro- gramming. 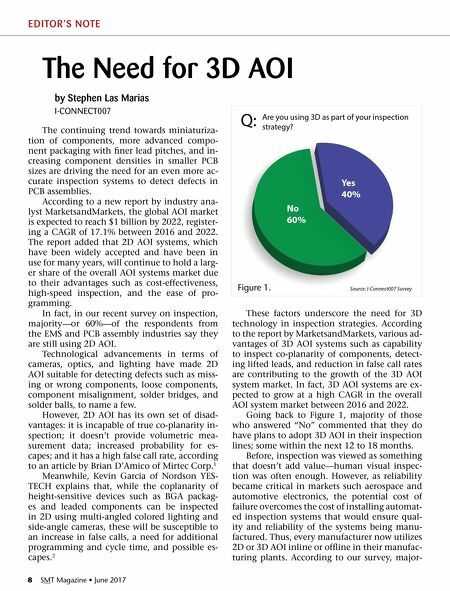 In fact, in our recent survey on inspection, majority—or 60%—of the respondents from the EMS and PCB assembly industries say they are still using 2D AOI. Technological advancements in terms of cameras, optics, and lighting have made 2D AOI suitable for detecting defects such as miss- ing or wrong components, loose components, component misalignment, solder bridges, and solder balls, to name a few. However, 2D AOI has its own set of disad- vantages: it is incapable of true co-planarity in- spection; it doesn't provide volumetric mea- surement data; increased probability for es- capes; and it has a high false call rate, according to an article by Brian D'Amico of Mirtec Corp. 1 Meanwhile, Kevin Garcia of Nordson YES- TECH explains that, while the coplanarity of height-sensitive devices such as BGA packag- es and leaded components can be inspected in 2D using multi-angled colored lighting and side-angle cameras, these will be susceptible to an increase in false calls, a need for additional programming and cycle time, and possible es- capes. 2 These factors underscore the need for 3D technology in inspection strategies. According to the report by MarketsandMarkets, various ad- vantages of 3D AOI systems such as capability to inspect co-planarity of components, detect- ing lifted leads, and reduction in false call rates are contributing to the growth of the 3D AOI system market. In fact, 3D AOI systems are ex- pected to grow at a high CAGR in the overall AOI system market between 2016 and 2022. Going back to Figure 1, majority of those who answered "No" commented that they do have plans to adopt 3D AOI in their inspection lines; some within the next 12 to 18 months. Before, inspection was viewed as something that doesn't add value—human visual inspec- tion was often enough. However, as reliability became critical in markets such aerospace and automotive electronics, the potential cost of failure overcomes the cost of installing automat- ed inspection systems that would ensure qual- ity and reliability of the systems being manu- factured. Thus, every manufacturer now utilizes 2D or 3D AOI inline or offline in their manufac- turing plants. According to our survey, major- E DITOR'S NOTE Figure 1.